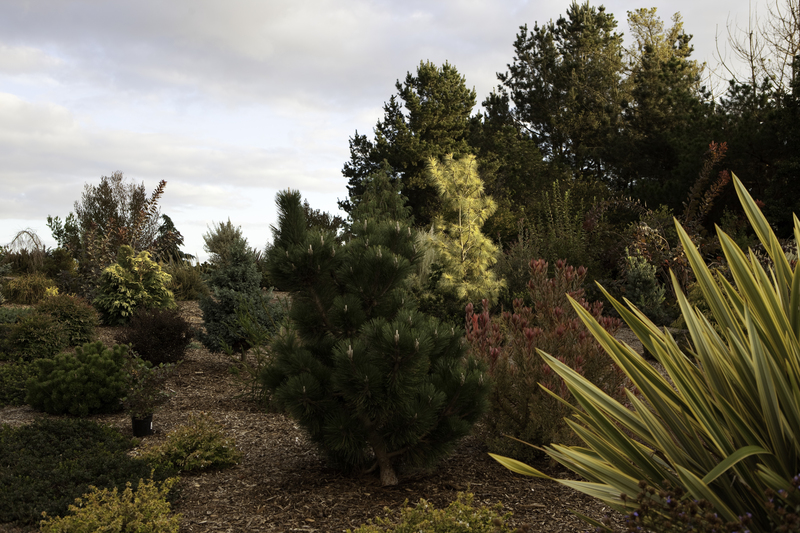 The display gardens at Iseli Nursery showcase a wide variety of conifers and companion plantings. 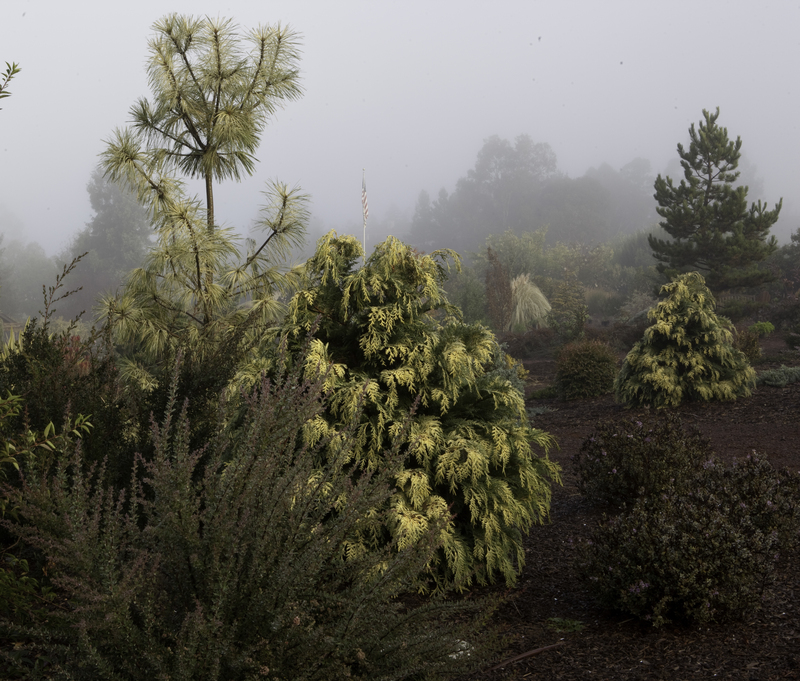 Conifer lovers from all over the world make the pilgrimage to the display gardens at Iseli Nursery in Boring, Oregon, which are immortalized on the company’s website and annual calendars and regularly featured in at least one blog. As part of our trek to the conifer nirvana that is the Pacific Northwest, we clearly had to pay both a call and our respects. 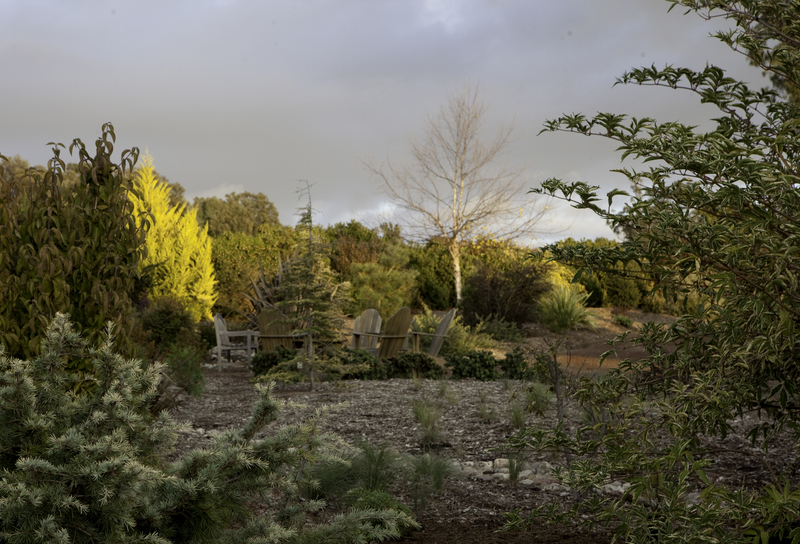 We were curious as to whether we would find the gardens even more awe-inspiring ‘in the fresh’ than on the page. 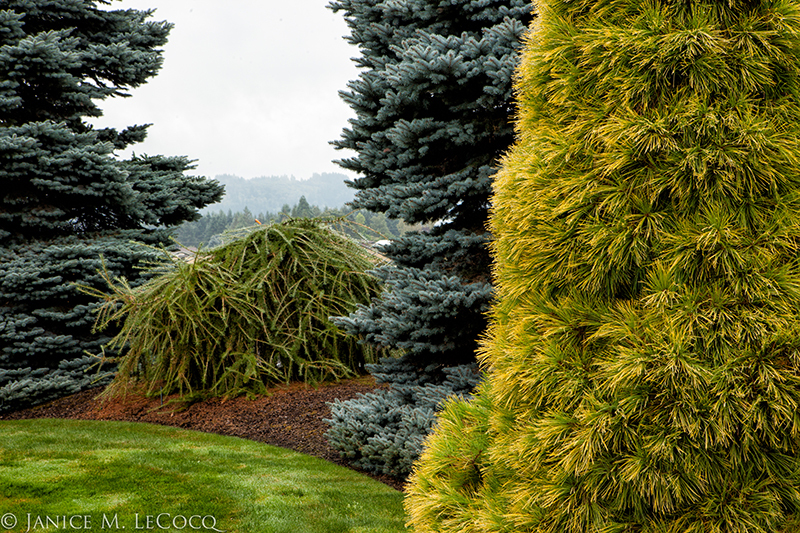 We elected to focus on contrasting colors, shapes and textures, rather than specimens. Indeed, we were struck with such a degree of sensory overload that we had trouble focusing at first (our eyes, that is, not the camera!) 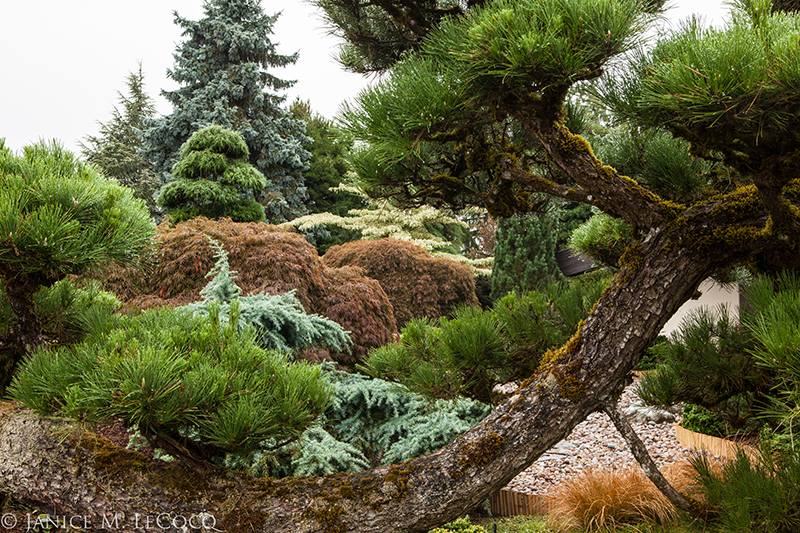 As we began to take stock of the richness that surrounded us, we realized that there were two ways to view the garden, as indeed there are any garden–by sharpening our focus to pick out the detail of each discreet specimen, a goal already ably achieved by other chroniclers, or by letting our lens go wider and take in the enormous range of textures, colors and sizes with which the gardens abound. 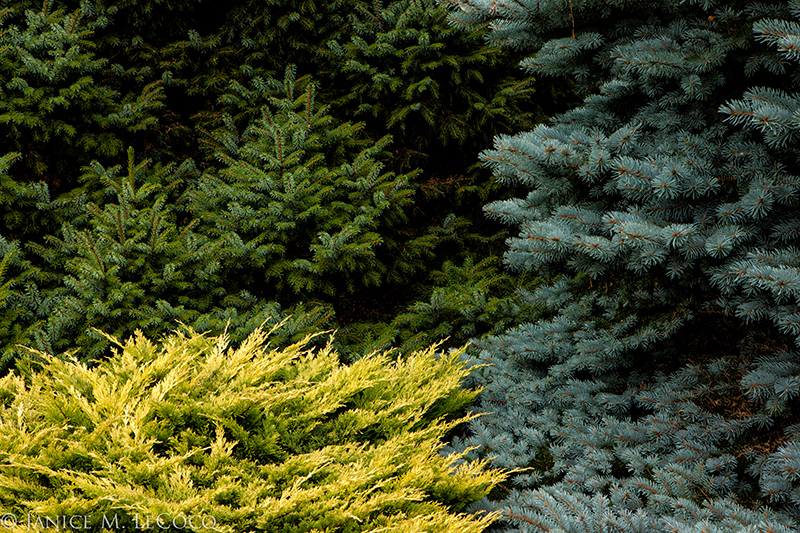 Rich green, Carolina blue and citrine – color-blocking is VERY 2013! 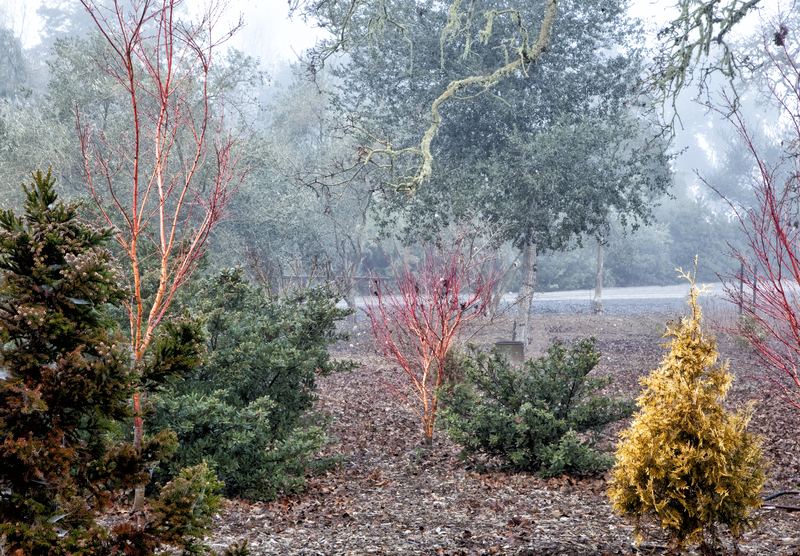 In the photograph above we showcase three common selections in deep hues readily available across a range of genus, species and cultivars. Skip the taxonomy for a bit and focus on how richly satisfying this simple combination is. 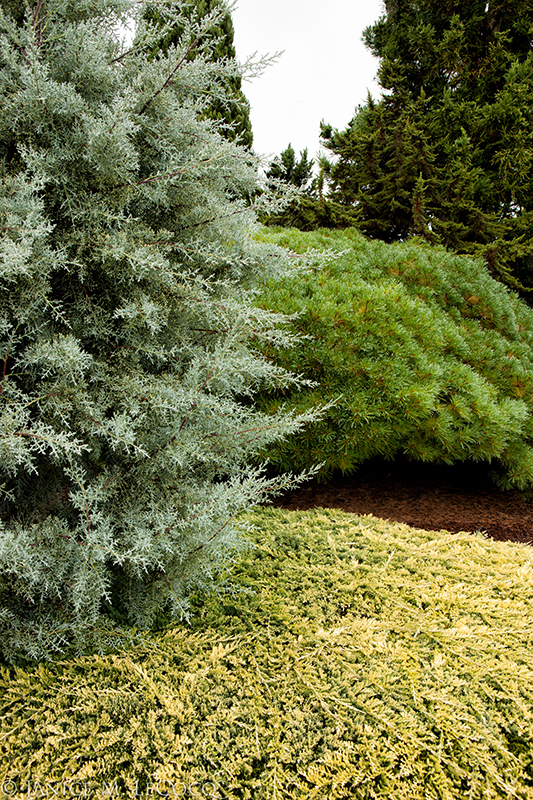 Add a dimension to the color by varying the textures. 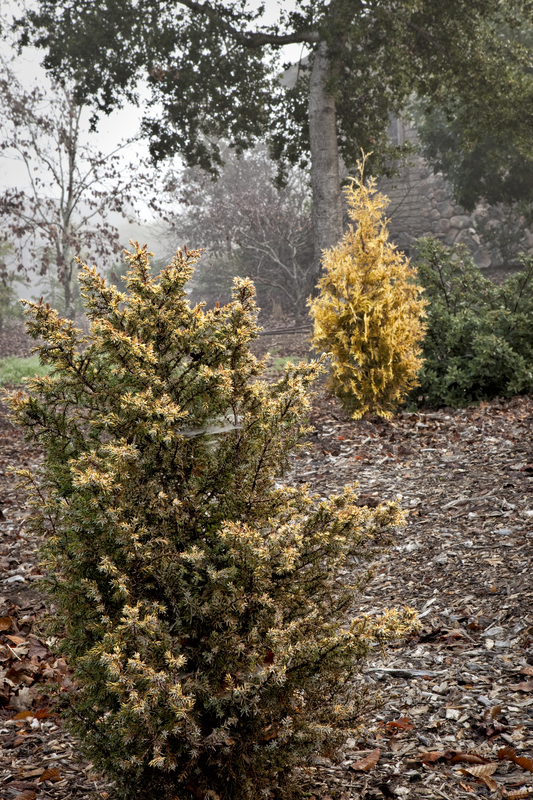 In the next shot, we stick with rich colors but vary the texture of the green specimen. 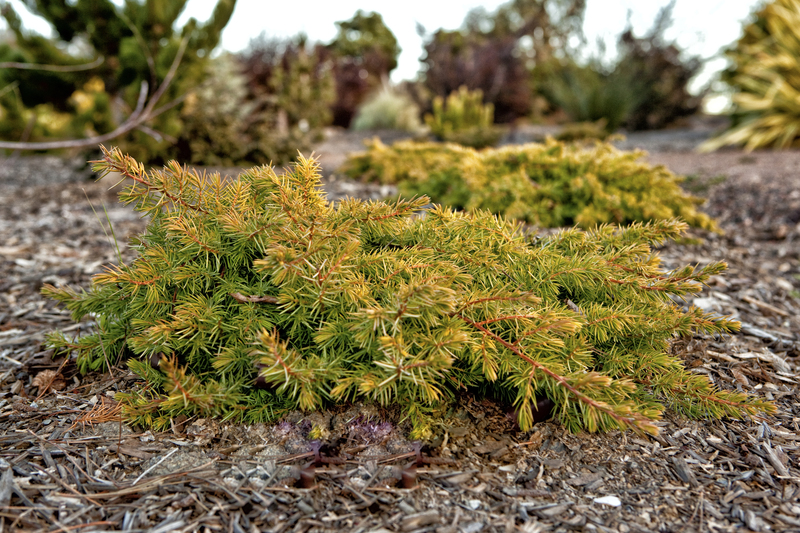 In this case it’s a spiky, starburst shape, but it could be weepy, spreading, lacy or bristly. 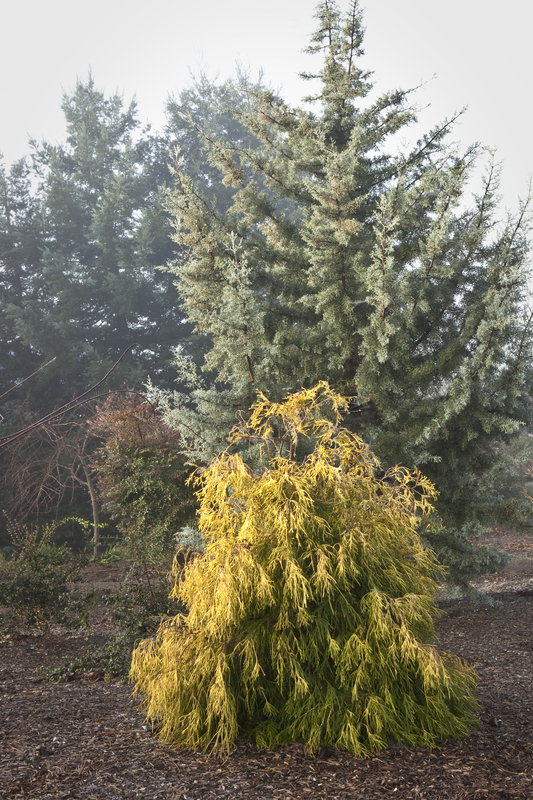 If you shy from the bold and prefer your colors softer, there are copious choices. 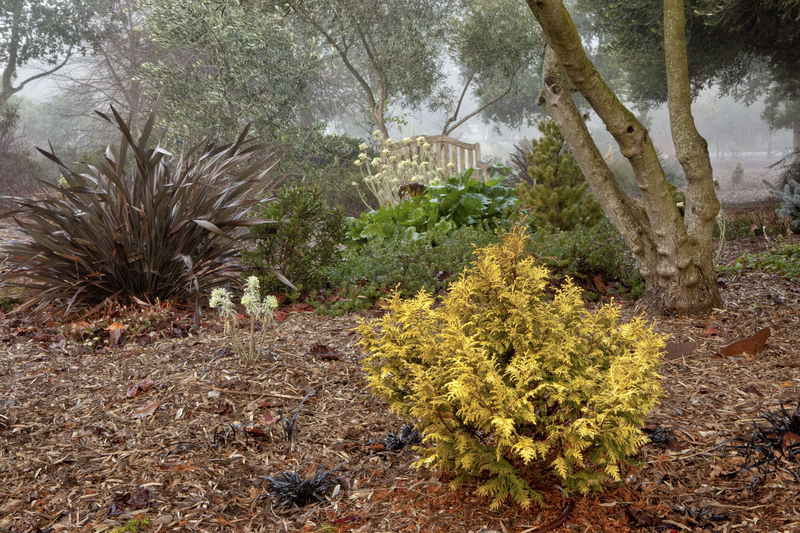 Like the master color mixer who adds a drop of black to a gallon can of paint to produce a smokier hue, plant breeders have combined with nature to create velvety gray-greens, muted yellows and olive tints to satisfy those who seek more subtle statements. 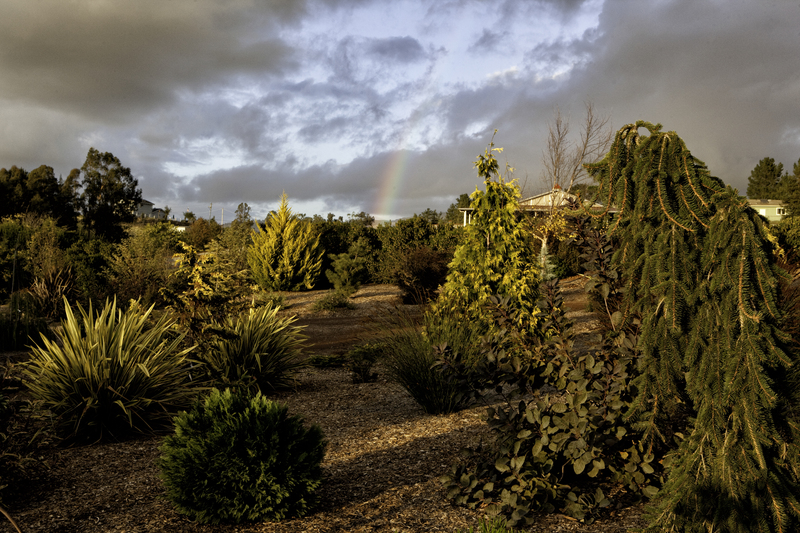 Soft colors create a calmer mood. 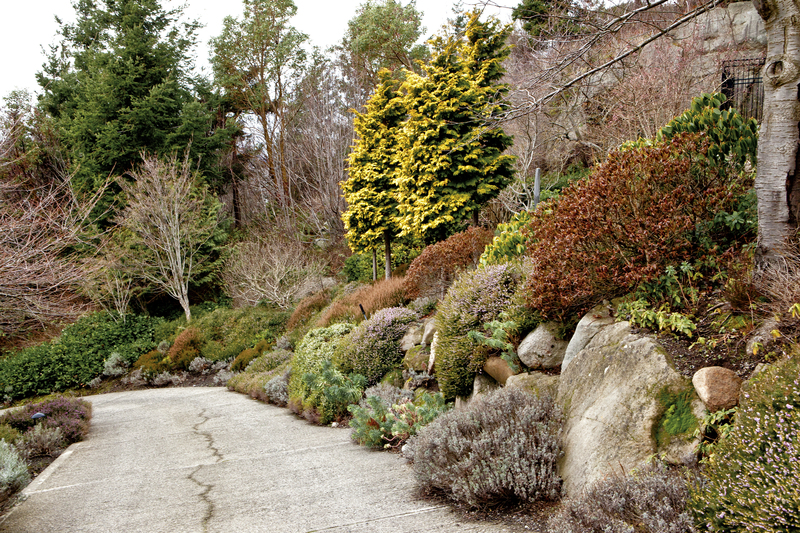 In fact, as the photo above demonstrates, a border of mixed foliage need not be strident or harsh. 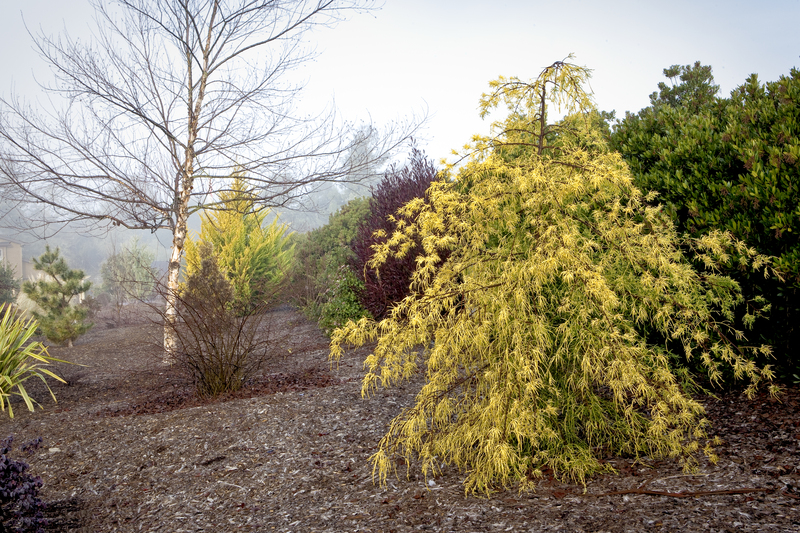 Deciduous plantings add an even wider range of textures and colors to the conifers. 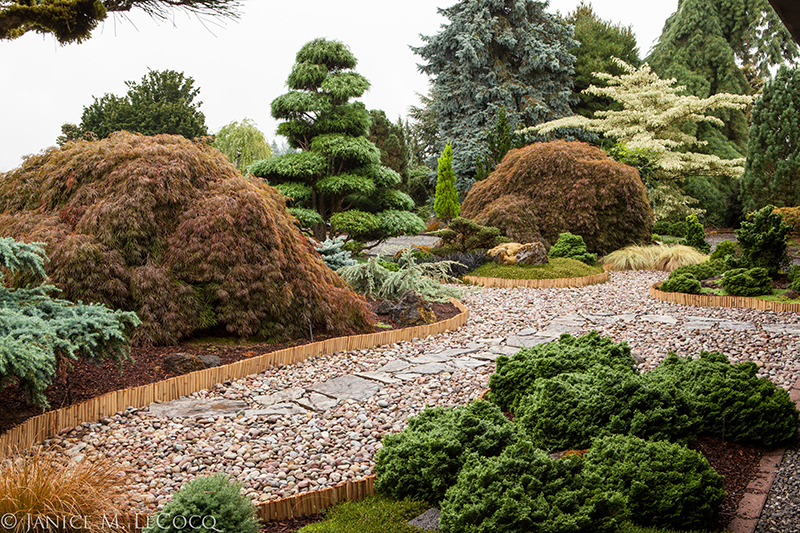 Adding deciduous plants such as Japanese maples or dogwoods softens the look still more and expands the range of colors, shapes and textures. 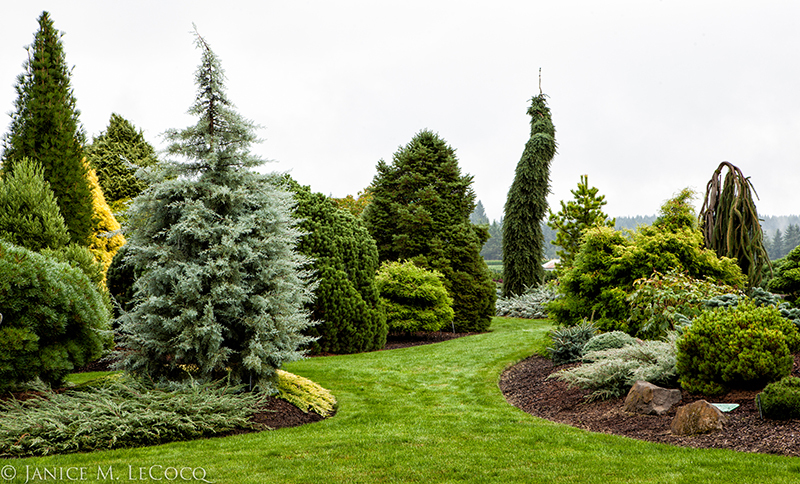 The grouping above adds a formal note with the sculpted Chamaecyparis in the center. 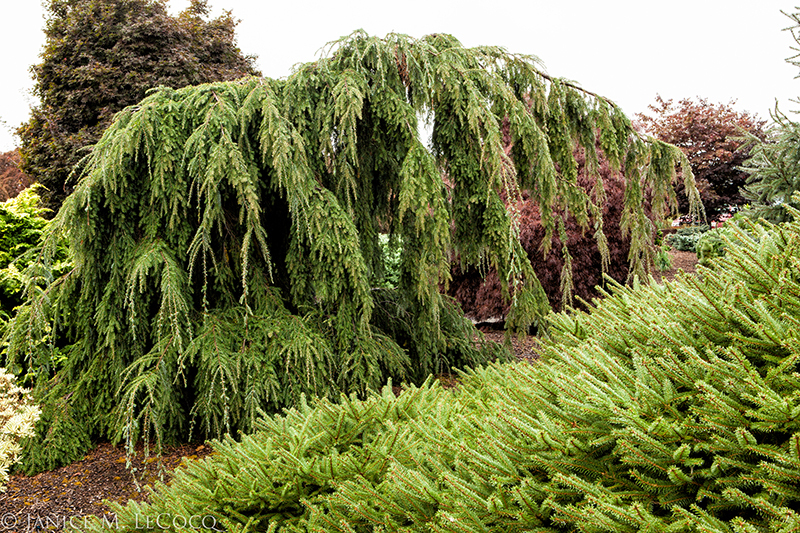 If you are not a fan of colored foliage, you can stick with conventional green and vary the shape. Think of yourself as a sculptor, rather than a painter, and go for a dramatic weeper flanked by a shag carpet. 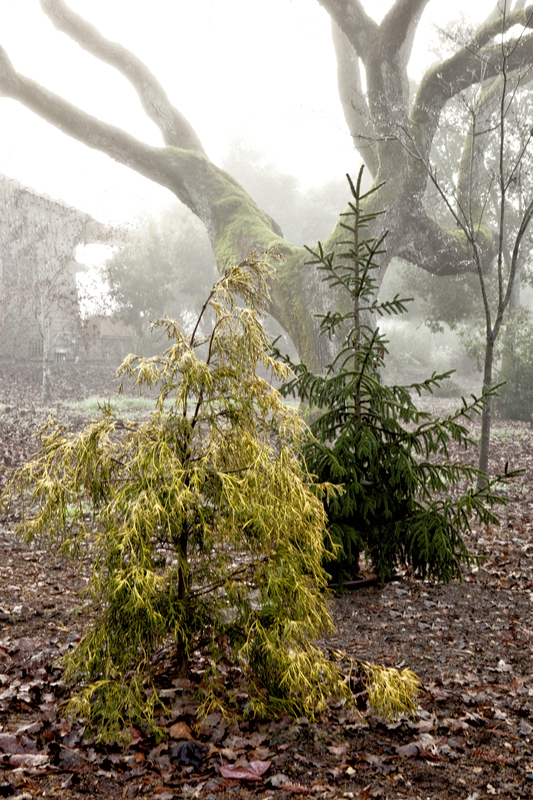 Admittedly, that bronze foliage in the background does a great job of highlighting the green. 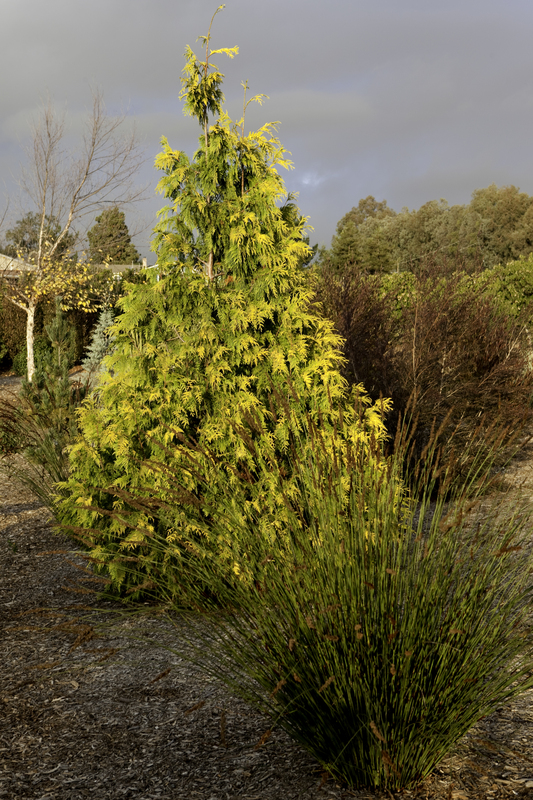 Once again, we add some deciduous foliage to mix it up even more. 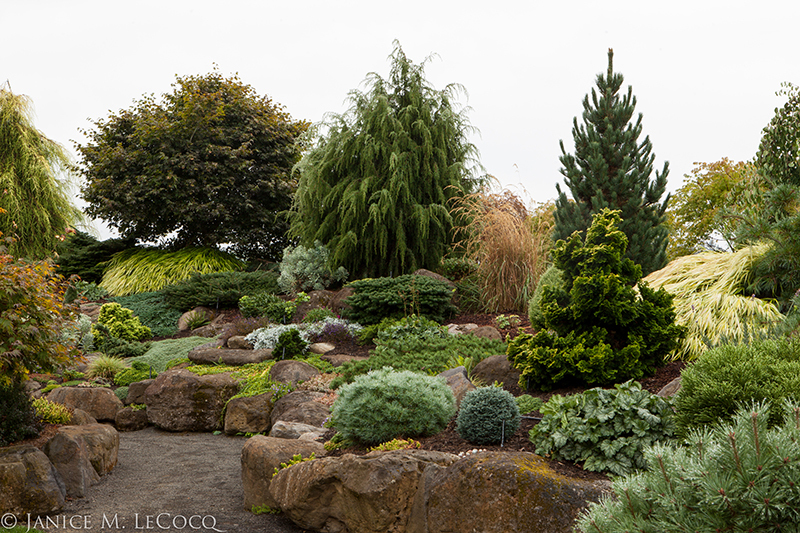 Note how the Cornus contriversa ‘Variegata’ adds a shape, texture and color beyond that displayed by the conifers. We love the way this ‘living room’ is decorated with a lemon-yellow carpet and a fuzzy green hassock. 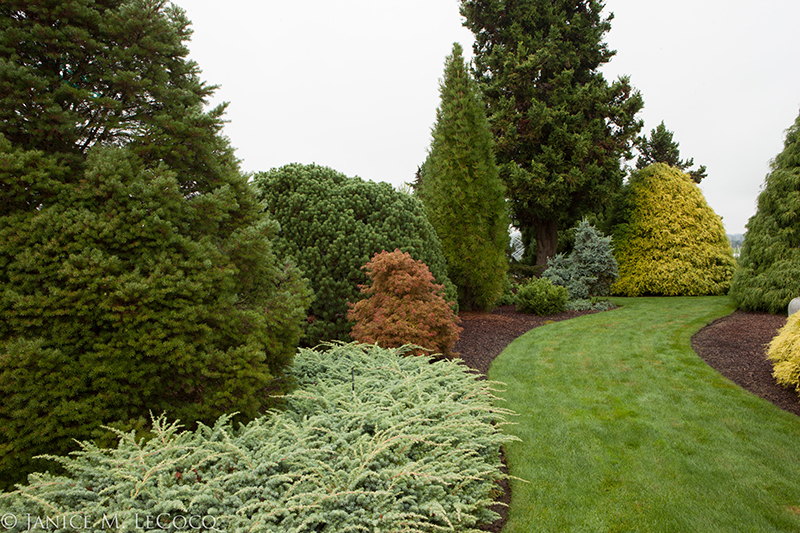 A velvety swath of turf grass soothes the eye and sets off the rich colors of the specimen plantings. 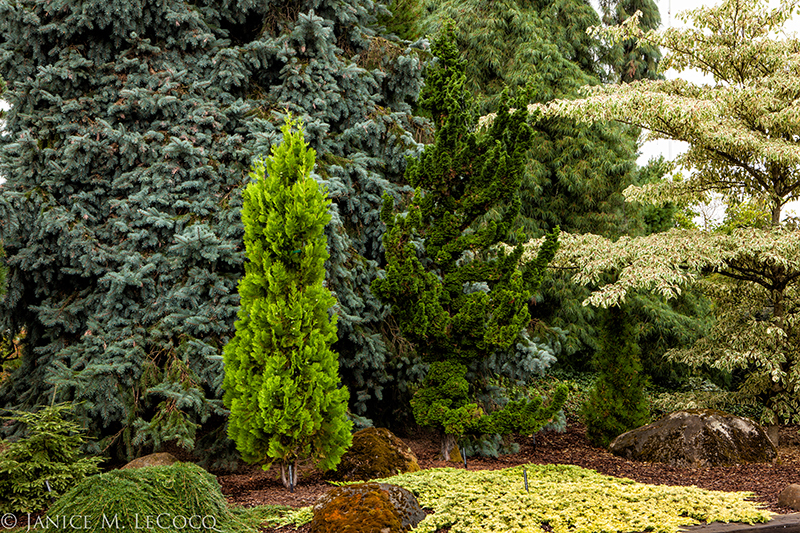 We will close with one of our favorite shots – a limited palette but a wide variety of shapes, sizes and textures, including the dramatically pendulous Picea abies ‘Cobra’, on the right, one of Iseli’s newest introductions. Next stop: Buchholz & Buchholz! 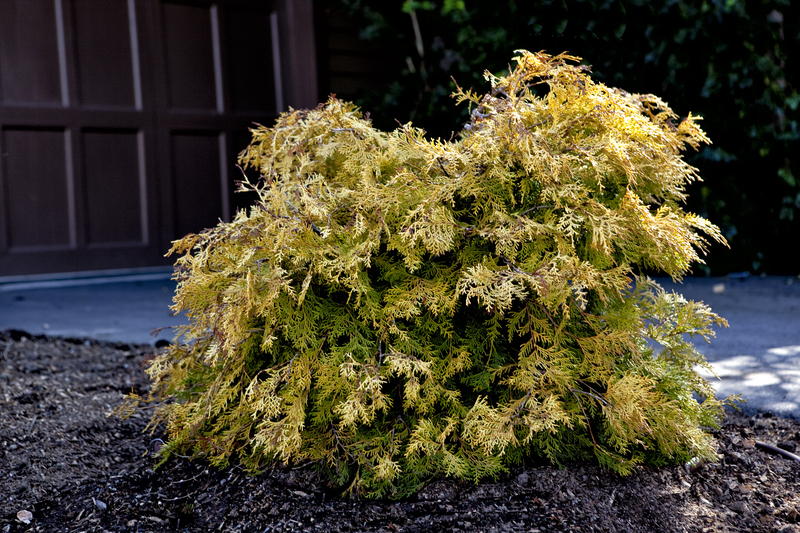 Categories: Autumn, Blue, Color combinations, Design philosophy, Gold, Iseli Nursery | Tags: conifers, evergreen shrub, evergreen shrubs, evergreens, foliage, foliage color combinations, foliage plants, garden design, golden foliage, japanese maples, shrubs, trees, woody shrubs | Permalink.